One day, I say to myself, I’ll have enough saved up that I don’t have to reinvest in my business so I can drop it on a full bottle of M.Micallef’s Ylang in Gold. The more I try of that, the more I fall in love with it. 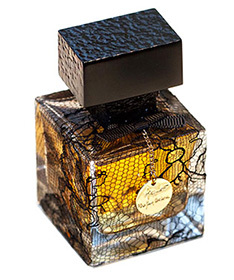 But the story for M. Micallef’s fragrances are often favorable. Most of the offerings from their line are great, and the vanillas are just to die for. I’m excited every time I get to try a new scent and this time it’s Parfum Couture. In Bottle: A strong tangerine showing with a kick of cinnamon and plenty of sandalwood. Applied: My favorite moment is the opening, crisp tangerine, tart with a spicy cinnamon kick. The fragrance is quick to roll into the mid-stage with a very tempered rose and orange blossom that layers itself beautifully over the aoud. I know a lot of people might be worried about the “animalis” note in this, but I honestly didn’t get very much, a little hit of castoreum and a pinch of musk and that was it. The entire progression from opening was very smooth with a prominent woodsy showing in the midstage as well as the end stage. It sweeps into a bit of patchouli with a warm clean amber at the base. Very nice, fairly well constructed, I was worried about the woods when they showed up early, but they behaved very nicely with the rest of the fragrance. Extra: Like all Micallef bottles, Parfum Couture beautifully hand-decorated and is available on Luckyscent! Design: I’m really digging the design for this bottle. A cool, modern shape wrapped in beautiful and delicate lace with a golden hang tag. Really nice, simple but at the same time dressy and fashionable. Notes: Cinnamon, tangerine, aoud, rose, animalis, amber, sandalwood, patchouli. Lovely scent, nice and smooth and well-behaved in a beautiful bottle. I’m still in love with Ylang in Gold, but this is still very nice. Reviewed in This Post: Parfum Couture Denis Durand, 2013, Eau de Parfum.